Terms of Service - Domain and Web Hosting Bangladesh. We setup clients domain hosting account after receiving full payment and check the payment balance before the account activation. It is your responsibility to ensure the email address on file is current or up to date. We send all hosting cpanel login details to your providing email address. If you provide any false contact information it may result in the termination of your account. When you order to our domain and hosing, you are buying a pre-paid service. All payments will be paid advance using Moneybookers, payoneer, Paypal, bKash, mobile banking and Bank Transfer. Renewal notices will sent some times via email from 1 to 15 days before the renewal date. If you are unable to renew the service to last renew date, your hosting and domain will be suspended and we are not responsible for any data loss. For web hosting plans we will setup your account without any paying. Clients are encouraged to pay by bKash as it is the easiest way to handle payment at this time in Bangladesh. All accounts are billed according to the dates they were first activation date. If you will not pay for service renew in 5 days before renew date, your account will be suspended as end date of payment. If you will not pay for service renew in 30 days after suspended, your account will be terminated. You will receive an email reminder 5 days till deactivation. Our technical team is always ready to help you to transfer your site to us from another hosting. We always try to do the best transfer of your all data from old host to our host. In fact Hosting transfer is not our duty, it is just bonus service. 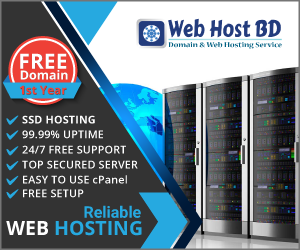 Web Host BD will transfer maximum one account for share hosting, 25 accounts for Reseller , 50 accounts for VPS and 100 Accounts for dedicated server for free first time. You have to pay fees for more transfer. If you use any service of Web Host BD is at your own risk. Our backup service is run on Friday of each week, and provided to you as a courtesy. Web Host BD is not responsible for files and data residing on your account. You are agree to take full responsibility for your files and data transferred and to maintain all appropriate backup of files and data stored on our servers. Backups will not be provided for accounts that have been suspended or terminated for any reason. Web Host BD reserve the right to cancel, suspend and restrict access to the account at any time with or without notice. If you are unhappy with the services you receive from Web Host BD during the first 30 days of service received (Only Hosting), you may request a full refund. You must describe a detailed reason as to why you are canceling. If we are unable to solve the problem within short tiem, we will full refund you. If clients violate the terms and conditions and suspended in that case refund will not be offered even if asked for cancellation and than agreed to continue using services can’t ask second time for refund.